Unlike Australian possums, opossums belong to the order Didelphimorphia. They live in the United States of America. Opossums are probably the biggest marsupials of America. 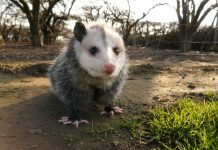 This article is all about opossums diet. 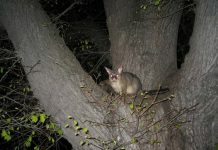 Like other possums, opossums also become active at night and they are arboreal too. Opossums are generally omnivores. Let us find out what do opossums eat in the natural habitat. The bare-tailed opossum likely consumes nectar, fruits, reptiles, birds, gum and vegetables. Opossums are known to prefer some plants over the other and their diet varies with the season. They will make habitats where plants are abundant. Bare-tailed opossums will fancy eating less common plants. Additionally, they will also feed on tree sap, vertebrates, invertebrates, arthropods, and nectar. About three fourth of the opossum’s diet consists of beetles whereas 25% of its diet comprises butterflies. 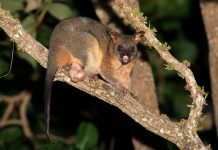 Bare-tailed possums eat fruits from these five main tree species: Symphonia globulifera, Humiriastrum subcrenatum, Dacryodes, nitren, and Tapirira guianensis. Derby’s woolly opossum primarily feeds on vertebrates, nectar, and small invertebrates. The opossum also eats fruits of Cecropia and pepper vines. It likes to drink nectar of Mabea occidentalis, balsa tree, and Trichanthera gigantea. Once they have finished eating, opossums usually clean their face using forepaws. Like others, brown-eared opossum are also omnivores. Fruits are essential part of their diet so they are also regarded as frugivorous. Opossums forage at night but their movement isn’t quite noticeable because they don’t make any noise. Thanks to the common opossum’s sharp teeth, they can chew just about anything. Opossums feed on vegetables, fruits, insects, carrion, and small animals. The Virginia opossum has a typical omnivorous diet. It is thought to consume numerous plants and animals. Prominent among its diet is snakes, snails, earthworms, small birds, insects, and carrion. 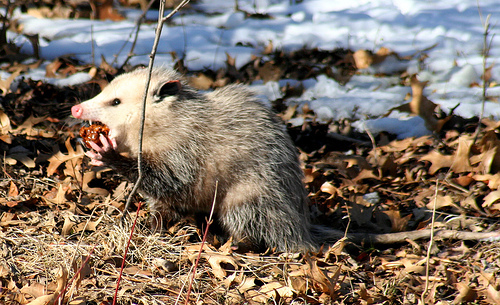 North American opossum supplements its diet with fruits and grains. The gray four-eyed opossum feeds on mice, snails, earthworms, birds, amphibians, crustaceans, and reptiles. Opossum also eats insects, nectar, and fruits. Unlike most other opossums, the gray four-eyed opossum is almost entirely immune to the toxic effects of venomous snakes. Thus, it has the ability to encounter even the most venomous snakes. Husson, A.M. (1978). 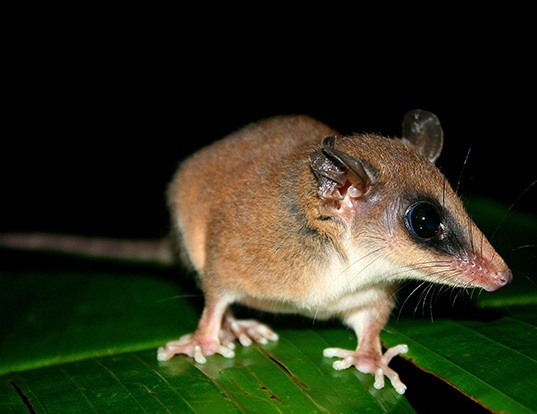 The Mammals of Suriname. Leiden, Netherlands: Brill. p. 9. ISBN 978-90-04-05819-4. Julien-Laferriere, D. (1999). “Foraging strategies and food partitioning in the neotropical frugivorous mammals Caluromys philander and Potos flavus”. Journal of Zoology. 247 (1): 71–80. doi:10.1111/j.1469-7998.1999.tb00194.x. Bucher, J.E. ; Hoffmann, S. (1980). “Caluromys derbianus” (PDF). Mammalian Species. 140 (1–4). Castro-Arellano, Ivan; Zarza, Heliot; Medellin, Rodigo (May 12, 2000). “Philander opossum”. Mammalian Species. 638: 1–8. doi:10.1644/1545-1410(2000)638<0001:po>2.0.co;2.